When I was young, I asked for a CD player for Christmas. I told my Dad that I wanted to listen to “real music” on it, meaning I was done with listening to the “kid” music I had grown up with – no offense to the likes of Fred Penner, Raffi and Sharon, Lois and Bram who I still have great love and respect for now as an adult. My Dad, the music aficionado he is and always loving a challenge, came back with three options for me – a Dance Mix album (remember those? ), Jagged Little Pill by Alanis Morissette and Pieces of You by Jewel. Way to go, Dad! ???? And while all those albums ended up playing on repeat in my new player, a special place in my heart grew for Jewel. Even at a young age I was struck by the depth of her lyrics, the way they tugged at my heart. And while at the time I didn’t fully understand what she was talking about in her songs, it hardly mattered – she still stirred my emotions, and I connected with her feelings. So it didn’t surprise me when I heard Jewel speaking in an interview on Sounds True about her relationship with mindfulness and meditation – how she intuitively came to it as a young person, and how it has become the backbone of her life. Beyond this, she also spoke about how mindfulness has guided her through making tough decisions about her career, her life and how to balance both. She spoke with great wisdom, humour and insight. And as someone who’s listened to a lot of people speak about mindfulness, I was impressed with the originality of what she said, framing mindfulness and meditation in ways I had not heard before. My biggest takeaway from the interview, though, was Jewel’s discussion of values and how they related to mindfulness. She shared a practice of mindfully reflecting on her values that she developed at a young age and that continues to guide her decision making now. Identify the core values you hold in your life – building solid relationships, showing kindness to yourself and others etc. Write down these values and keep them in a place you can easily access – amending or adjusting them as you grow and learn. At the end of each day, retrieve your list of values and review whether you lived them out in your actions, thoughts and words. Do this from a place of curiosity, simply noticing how you responded to the day, without judgement or self-criticism. Identify if there are certain values which you did not fully live out or embody. Notice what circumstances brought that to pass and what you possibly could have done differently. Commit to living out those values tomorrow, identifying one specific action you can take to help you do that – ie. If your value is “to be of service”, identify one person you can serve tomorrow and one action you can take to serve them. It could be as simple as calling a friend to see how they are doing or running an errand for a family member who is pressed for time. That’s it. Simple, but so effective. By creating a practice of continually checking in and recommitting to your values in your everyday life, it becomes easier to stick to those values when you’re faced with bigger, more challenging decisions – especially related to your performance career. 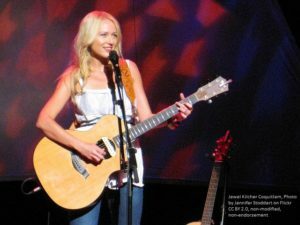 For Jewel, this has meant choosing building solid relationships over selling millions of records – it’s meant valuing her fan base, serving them and authentically cultivating her relationship with them over striving to manufacture a billboard hit that would appeal to the masses, but leave her feeling disconnected from the people listening to her music. A career-defining choice. Jewel also spoke of how surrounding herself with people who are aligned with her values has also been incredibly important for her. These are the people she calls on when she feels lost and is wrestling with big challenges. They are the ones who guide her back to her values, remind her of her commitment to them, and encourage her to let them guide her decision making. As performers these people can be our family and friends – but they can also be our coaches, trainers, directors, producers or agents. These are the people that help shape our careers and help us achieve our goals, so it’s essential that they share the same values we hold close to our hearts. These shared values will be the anchor for our work and are the key to building success in our careers. So take some time, try out Jewel’s exercise, and see how your values can move you forward in your work from a place of groundedness and authenticity. If you want to hear more from Jewel on how mindfulness and meditation helped grow and shape her life and work, you can check out her website: www.jewelneverbroken.com. And while the interview I listened to is no longer available, there’s lots of great stuff on her site including more practical exercises she’s used to help guide her throughout her life. And if you’re looking for someone to help you identify your values or guide you back to them when you feel you’ve gone astray – I’d love to be there for you. Let’s chat! ??? ?